There is abundant literature concerning this event and its inter­pretation. What does this event mean, and which interpretation is possible? In addition, what is it that is shown by God to Moses on Sinai, and what did he see? What was the basis for his making the Tabernacle? Why did Deacon Stephen refer to this matter just at the moment of his martyrdom for Christ, when he himself "being full of the Holy Spirit, gazed into the heaven and saw the glory of God, and Jesus - the Son of man - standing at the right hand of God"? Why, then, did the author of the Epistle to the Hebrews come to consider the same event that happened to Moses and Stephen, that is, the event which they both had seen, each in his time and in his own way? It would take too long to retell the whole Epistle to the Hebrews, but we are bound to turn our attention to the leading thread which in reference to the aforesaid event is woven throughout the whole epistle. At the outset, I would like to remind you that the same theme was treated by the Church Fathers, particularity Saint Gregory the Theologian and Saint Maximos the Confessor. Gregory the Theologian writes: "From time immemorial (i. e., throughout history) there have been (γεγόνασι - it happened, it took place) two great and public transpositions (μετάθεσις - transfer) of human life (= historical living), which are also called two covenants (δύο διαθῆκαι) and earthquakes, due to the great significance and ma­jesty of the matters themselves. One transfer was from the idols to the Law, and the other one from the Law to the Gospel. We preach (εὐαγγελιζόμεθα) a third earthquake as well - the removal (μετάστασις) from here (from the earth) up to there (to Heaven) - of what is shaken "in order that what cannot be shaken may remain" (Heb 12.26-28) (1) . Then, as is known, he speaks of how the Old Testament preached the Father clearly, and the Son in opaque fashion, like a shadow. The New Testament manifested the Son, and only pointed to the divinity of the Holy Spirit. And now we live together with the Spirit (ἐμπολιτεύεται νῦν τό Πνεῦμα) and he gives us a more ready manifesta­tion of himself (2) . From these two references it is apparent that the Fathers speak about a gradual, stage by stage, divine revelation and development of sacred history, about the epiphany of God, to those of us who are in the world, which leads us to knowledge of God and communion with God. This is what the whole Epistle to the Hebrews speaks about, and we are going to consider this now, as well as the event of Moses vision on Sinai, on which is based the typos of the Old Testament Tabernacle. The Epistle to the Hebrews begins with the prominent statement: "In many and various ways God spoke in times past (in the Old Testa­ment) to our fathers by the Prophets; but in these last days (in the New Testament), he has spoken to us by the Son (the incarnate Christ), whom he appointed heir of all things through whom he created the world" (Heb 1.1-2). It is obvious that Paul speaks here about the gradual revelation of God: before Christ, during the earthly life of Christ and later on in the future Aion. What is said about the past, the Old Testament, is indisputable; this is likewise true about what is said about Christ's time, the New Testament, but one has to underscore especially that the author of the Epistle to the Hebrews clearly points out the eschatological future as well. 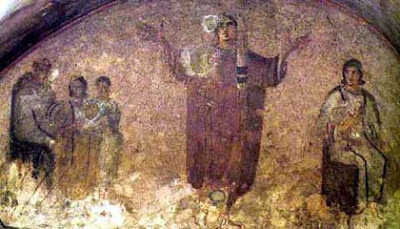 For, later on, he says that God made it that Christ, his Son from eternity and the creator of the world and the ages, whom he as the "First-born" brought in­to the world" and after he had suffered for the "purification of (our) sins," now "was seated at the right hand of the Majesty on high" (Heb 1.3-6 and the whole context of chapters 7 to 10). This three-member scheme, that is, this vision (understanding) of the revelation in three stages, is observed by the Apostle throughout the Epistle to the Hebrews, especially in Chapters 5-10, where he elaborates the theme of the Old Testament high priest, and on Christ as "the High Priest of the good things to come" (τῶν μελλόντων ἀγαθῶν, or τῶν γενομένων ἀγαθῶν, i.e., of the realized goods, as it appears in other manuscripts - Heb 9.11). However, can we really speak about three stages of world history and of God's relation towards the world? And what do these three stages mean, and what is the relationship among then? Or, to resume our first question: What did Moses really see on Sinai? Although it is said that "the Lord spoke to Moses face to face" (ἐνώπιος ἐνωπίῳ, Ex. 33, 21), Moses nevertheless did not see God's face, but only God's "back" (τά ὀπίσω, Ex. 33,23) while he (Moses) was covered and preserved by God's hand during his passing by and when Moses was in a cleft of the rock. Gregory the Theologian sees in Moses' vision the coming incarnation, the manifestation of the Christ incarnate, by which men were enabled to have a vision of God (4). This interpretation by Saint Gregory gives us at the same time a proper key to the comprehension of Moses' vision of the "Typos" on Mount Sinai, upon which he erected the Tabernacle. Without doubt, that was the vision of the future reality of Christ's church, according to which, although it is still to come, Moses erects the Old Testament tabernacle as a shadow of the future reality (Heb 10.1; 8.2,6-7). However, here we have to put a question: of which future reality? That of the historical church in the New Testament or that of the Church in the eschatological kingdom? That is, did Moses see on Sinai the coming historical church, the one which came into existence in the world with the Incarnation and Pentecost, or the heavenly church such as will be after Christ's second coming, in his kingdom? Moreover, another question is raised: are these really two realities - are these two different churches? From all these questions one point is clear: we find ourselves embroiled in our theme concerning the relation between the Church and the kingdom. This biblical and especially apostolic and patristic understanding of Moses' vision and its interpretation obviously are characteristically eschatological, of course in the sense of true Christian eschatology, in which the perspective is not primarily chronological but christological as well as eschatological, where the past, present, and future are interwoven, linked together and sometimes interactive (5). Therefore, Moses' vision of typos on Mount Sinai does not refer to the past, or to the "world of eternal ideas," but to the eschatological "future goods," the "future reality," which is to become, although it appears as already existing, as "preexistent." For this reason some of the Church Fathers talk about the "preexistence of the Church," so that the Church existed even in Paradise, in spite of the fact that John's Apocalypse shows that Paradise is merely an eschatological reality, an idea especially developed by Saint Ephraim the Syrian in his inspired "Hymn on Paradise," in which Paradise is seen as the basic point or the axis of all of history, and is apparently for Saint Ephraim a primarily eschatological and protological reality. It becomes clear from what we have revealed that the biblical vi­sion of world history, and of God's revelation in it, is eschatological vision and understanding. Although a biblical and especially Chris­tian understanding of history is an extraordinary novelty in relation to the world of antiquity, nevertheless this biblical, Judeo-Christian understanding of history, for the Orthodox, should be conceived from this eschatological perspective. History so conceived is understood not merely in the linear sense, in the sense of historic continuity, historical processes, and successive chronological movement and development, but rather in a unique eschatological event, where time and history are contained and at the same time are transcended, overcome, and brought into the new eschatological aion of the kingdom. This Event is Christ, or Christ's Mysterium, according to the wor­ding of Saint Paul and Saint Maximos. We shall discuss this event-mystery because it is actually the key question for our theme of the Church and the kingdom. The event of Christ or Christ's mystery (τό μυστήριο τοῦ Χριστοῦ - Eph. 3.4,9 ; Col 1.26-27, 2.2) is dealt with not only in the Epistle to the Hebrews, but also in some of the other of Paul's epistles, and the whole New Testament as well. It is the very reality, which con­tains in itself the whole truth, the whole reality of the Church, and also the whole truth and reality of God's kingdom. Christ as the in­carnate God-man (Θεάνθρωπος) is both Alpha and Omega of God's entire revelation, God's oikonomia of salvation of the world and humility, the Alpha and Omega of history, and of the whole of eschatology. Christ became so because he made himself incarnate, became man in history, and that historical event became the center and focus of history, where the beginning and the end join, the ἀρχή and τέλος of all created beings. Due to the fact that all creation, all beings created by God's will and love, are directed to the future, to their goal and destination, to their pleroma and perfection (which is not in the past, but in the future, in eschatology), the incarnate Christ has been placed from the beginning as the mover (moving force) of all beings and of history, as their "anticipated and predestinated goal" - πέρας and τέλος according to Saint Maximos the Confessor (6) . One must also compare Maximos ' other texts, where he says that "the mystery of the Incarnation of the Logos" contains the key to everything that is said in the Holy Scripture (7) . For both a proper and full knowledge of all creation, the event of Christ's resurrection contains the full mystery (reality) of eschatological content of pleroma and telos of everything that God created and for what he designated them. It is not necessary to belabor the basic theological truth that Christ, the incarnate and resurrected, is the center and telos of history and the pleroma of eschatology; consequently, he as God-man (Θεάνθρωπος) is the center both of the Church and the kingdom. The whole Church and its history, which is at the same time the history of all creation, of the whole world, is determined by the Incarnation of Christ, who is the aim, fullness, and perfection of every created be­ing. However, at the same time we must emphasize that eschatological end (telos) has by Christ's incarnation entered into history and become its part and its inner mover (moving force) towards ultimate finality. So, in Christ is fully embraced also the whole Old Testament, the past, the aim and designation of which is to inspire movement towards Christ. In him is also embraced the whole of world history, the history of salvation, because he is the core and heart of the history of humanity, so that Christ's mystery, the Church (for the Church is the body of the incarnate Christ, and is identified with Christ) is the central focus of history. The Church is the evangelical leaven and the first fruits (aparhe) of the true future world history, of eschatology, and so it is at the same time liberation from its (history's) limitedness, corruptibility, perdition, and mortality. So Christ in the Church and with the Church (by himself as the Church) introduces the eschaton already here into history. He brings the new aion of the kingdom here and now (hic et nunc). How does this new aion happen? Such is the meaning of the eschatological character of the Church, which is our theme. However, we need to make it more explicit. By indicating the christological and christocentric character of the Church, in its history and also in eschatology, in the kingdom, it is necessary to point out an important truth of Orthodox theology concerning full and authentic christology, which is linked with triadology, and especially with pneumatology. In other words, we should bring to the fore the Orthodox, apostolic, patristic vision of catholic, integral christology in all its theanthropic dimensions, and not treat christology separately and individually (as "christomonism") as often happens in traditions foreign to Orthodoxy. In this way we come to the truth that Christ and Christ's mystery are one and the same, that the Church and Christ are the same, that Christ and the Kingdom are the same, that the Church and the Kingdom are the same. But this identification is not just philosophical; it has its theological, Orthodox character, where an identification does not mean an abolishment of the difference between the unalterability of the uncreated and the created, between God and man, between the ontological reality of two natures, as we are taught by the dogma of Chalcedon. This identification primarily indicates that the uncreated and the created, divine and created being, are brought into communion in Christ, into the unity of personal communion, into the unity of the true life, which cannot be interrupted any longer either by nature or by any limitedness, corruptibility, perdition, or mortality. In Orthodox Christology, viewed in this way, the focal point of the relationship between the Church and the kingdom is the Holy Spirit. Christology in Orthodox theology is most closely connected with pneumatology, and they presuppose each other. We should bear in mind that, according to Orthodox theology, the role of the Holy Spirit is great and very significant in the whole oikonomia of salvation, realized in Christ and in the Church. It is precisely the Holy Spirit who in the oikonomia opens the entire history of salvation for "to eschata" for the eschatological reality of the kingdom, and it is he who liberates history from every limitation, from perdition and death, by bringing, through the Church, God's grace and life of the New Aion into the world and history; consequently, the Holy Spirit presents eschatological reality. Only by the grace of the Holy Spirit can the Church be, and is, that which Christ said: "(They are) not of the world" (Jn 17.16); Christ's kingdom has started with the Church in the world, in history, but that kingdom is not of this world. So the Church, thanks to the pentecost of the Holy Spirit (and not only to the Incarnation), is not a mere historical reality, a human historical society - a "religious community," which historically continues through centuries and has a certain mission in the world - but is much more. It is the reality of eschatological character. The eschatological character of the Church is manifested primarily and most fully in the Eucharist, in the liturgy of the Church, as an eschatological synaxis of the faithful and of all creation in Christ by the power and grace and energy of the Spirit, the Comforter. It is in the liturgy where the historical reality of the Church is connected by the Holy Spirit with the eschatological reality of the kingdom. It is the Holy Spirit who connects all the members of the body of Christ with Christ himself, and all the members amongst themselves (a theme which is elaborated at length by Saint Paul in his epistles, especially in the more eschatological ones). The Holy Spirit connects in the Eucharist of the Church both present and future, history and eschatology. For this reason, by the Holy Spirit the Eucharist of the Church, in its character, is always eschatological. But it does not mean that history is denied in the Eucharist, in the liturgy; rather, the historical happening and the living of the faithful are connected with the eschatological event of the encounter of and union with the kingdom and participation in the kingdom, which is the realization of the living community of God the king. Let us now in more detail deliberate upon this matter of the holy Eucharist in the context of our theme concerning the Church and the kingdom. We have quoted the words of Saint Gregory the Theologian and Saint Maximos about the stage-like development of the history of salva­tion, about the Old and the New Testament and about the future aion. We are especially reminded of Maximos' words that the Old Testament is the shadow, the New Testament the icon, and the future state, the truth (8). Obviously, Maximos here follows the Apostle Paul, especially in the Epistle to the Hebrews, but he also follows Dionysios the Areopagite and the whole patristic tradition of the Orthodox East. However, the problem is this: could it be said that the reality of the New Testament church is only icon, and not yet truth? In symbolic interpretations of the Divine Liturgy, most prominently by the Areopagite (9), the Eucharistic gifts are often referred to as symbols. Saint Maximos applies this thinking to some extent in his Mystagogy. However, some time later, when iconoclasm appeared, the Orthodox theologians in Byzantium sharply reacted against the thesis of the iconoclasts that, while it would be impossible to paint Christ in an icon, the only true and real icon of Christ would be ac­cording to their teaching, his Body and Blood in the Eucharist (10). The holy Patriarch Nikephoros I and Saint Theodore the Studite em­phatically repudiated the statement that the Gifts in the Eucharist are only the "icon." They state that they are the "mysteries of the truth itself (τά τῆς ἀλήθειας μυστήρια) and that the holy Eucharist is "the contents and recapitulation of the entire oikonomia of salva­tion " (συγκεφαλαίωσις τῆς ὅλης οἰκονομίας), according to Saint Theodore the Studite (11) . According to Saint Nikephoros of Constan­tinople: The Eucharist is not the typos of that body" (of Christ), but "although symbolically performed, it is the deified (θέοθεν) body of Christ," because "by the epiklesis of the priest and by the des­cent of the Holy Spirit, they (the Gifts) change into the body and blood of Christ," because the incarnate Christ himself is "our High Priest, and Lamb, and Sacrifice (12). From all this we can conclude that the meaning of the icon in the quoted passage of Saint Maximos obviously has another meaning, not the classical Hellenistic one, used also by the iconoclasts. Such a patristic meaning of the icon, as suggested by John Zizioulas (13), is the biblical understanding, apocalyptic, and liturgical, which under the word "icon" shows the vision of the eschatological truth primarily in person, in personality, so that one might say that the Son of God is the "icon of the Father," which absolutely does not mean that he is not the truth, but that he is in a living and personal relation with the Father, and that one reflects in the other like in a "mirror." This is just the same as what Saint Paul says in the First Epistle to the Corinthians, that we now see in a mirror dimly and we know only in part, but when "to teleion" (fullness) comes, then we shall see face to face and the "in part" will be fulfilled. Strictly speaking, I think that for the Orthodox, it is clear that the Old Testament cannot be seen as a pre-stage of the New Testament, neither can the New Testament be seen in the same measure, as a pre-stage of the eschatological kingdom. Of course, a graduality has to be taken into account, but not also the same measure and distance between the Old and the New Testament and the kingdom. "Christ's mystery - το κατά Χριστόν μυστήριον - is more mysterious (μυστηριωδέστερον) than all divine mysteries, and is the determinative (ὁριστικόν) mystery for every existing and future perfection (τελειότητος ), and stands above every limit and end (ὅρου και πέρατος ). This mystery teaches us that with the incarnate and perfect Godman, the Logos is and does ex­ist with the human body which he took from us, and which is of the same essence (ὁμοούσιον) with us, and which is united with him by the hypostasis (καθ ' ὑπόστασιν), by which he ascend­ed to heaven, above all rule and authority and power and domi­nion, and above every name that is named, not only in this age but also in that which is to come (Eph 1.21), and where he is sitting now and for the endless ages together with God the Father, having sublimated all heavens and having placed himself above them; and he will come again for the sake of renewal and transformation of everything (ἐπί μεταποιήσει τε καί μεταστοιχειώσει τοῦ παντός) and for the salvation of our souls and bodies" (14). Next to this highly significant thought of Saint Maximos, we must not forget some other noteworthy apostolic-patristic testimonies to Christ's mystery of presence and identification with the Church in the holy Eucharist here and now (hic et nunc), with which the mystery of eucharistic communion and unity of the whole church with Christ in the future kingdom is identified (15). So, the eschatological heavenly kingdom will not be anything other than the eucharistic meal of the Kingdom, the eternal liturgy and the trinitarian koinonia with all of us (Rev 19.9, 17; 2 Cor 13.13). Consequently, the holy Eucharist, ever since the Last Supper, was the eschatological meal of God's people in history. Hence, it is in the holy Eucharist, both as anamnesis and as epiklesis, that the Church experiences a sublimation of division of time, an overcoming of the past and the present and the future; it experiences their organic unity, so that the past has a new reality in the present, and in that same liturgical present the future already becomes the present reality. As it has already been observed by Or­thodox theologians, the Church experiences in the Eucharist not on­ly the "actualization of Christ's sacrifice on the Cross," but also the eschatological kingdom of the resurrected Christ as the already pre­sent reality (16). All that is possible, of course, thanks to the eschatological dimension of Pentecost, permanently present in the Church, which is the descent and effect of the Holy Spirit, and which is the proper explanation for such an emphasized character of Or­thodox ecclesiology and Orthodox theology in general. Nevertheless, Orthodox theology emphasizes an organic, but also a dynamic, so to say, dialectic relation between history and eschatology. It is one and the same: the community of Christ's body, the Church of God 's people in history and the "church of the first-born" in the heavenly kingdom (Heb 12.22-23), However, there is still an arena of spiritual effort and movement. One and the same reality is effected, but it is the living organism in its growth, in the living dynamic move­ment of those not yet quite grown up children of God, going from one spiritual effort to the other, "from grace to grace." Such is the living charismatic, sacramental growth of the Church as the body of Christ: "for the equipping of the saints, for the work of ministry, for the building up of the body of Christ, until we all attain to the unity of the faith, and the knowledge of the Son of God, to the measure of the stature of the fullness of Christ," the resurrected one (Eph 4.12-13). This dynamic vision of Christ's growth is important for the right comprehension of the relation between the Church and the kingdom in historical life and movement of the Church towards eschatological telos and fullness. There could not be any of this fullness as long as death is present in the world, with creation and humanity (cf. Rom 18.19-23)-that is, until the parousia and the universal resurrection come. This belief is actually what allows for the iconic understanding of the New Testament in its relation to the future aion , not only by Saint Gregory the Theologian and Saint Maximos the Confessor, but also by such eucharistic-oriented theologians as Saints lgnatios of Antioch and John Chrysostom. For example, Saint John Chrysostom rightly observes, in reference to the question of what God's kingdom is, that it is "Christ's parousia (coming), the first one and the last one" (βασιλείαν τήν παρουσίαν αὐτοῦ, την προτέραν και την ἐσχάτην φησίν) (17). Saint Maximos writes quite similarly when talking about the "per­manently present grace of the Holy Spirit, which works and performs sacraments in the Church," and about the Holy Spirit, Who will grant us his gifts (eschatological reality) "by the truth itself and in full reali­ty" (κατά ἀλήθειαν ἐνυποστάτως, αὐτῷ τῷ πράγματι), when we are liberated from corruptibility and mortality, that is, when our true deification is made possible (18) . In the light of this theological understanding of Orthodox eschatology, it is necessary to say, at last, the following. The eschatological character of the Church, although expressed and brought to its culmination in the Eucharist, manifests itself also in all other dimensions and activities of the Church's being and life in this world and history. First of all, the Church itself as community, as the people of God, is not and must not be confined only to historical human society, be it even "religious" and "Christian"; the Church is primarily in history the assembly (synods) and gathering (synaxis) of all God's children around the "first-born among many brothers" (Rom 8.29). Thus, all the ecclesiastical ministries and institutions and structures must be placed and considered, always, within the eschatological dimension of the Church, because only in this way may the ministries and their diakonia , and the mission of the Church in the world not be determined by simple, secular categories (love, for example, as sociological perception regarding the "implementation of the kingdom of God in the world with peace, justice, and equality," or identifica­tion with so-called "liberation theology," etc.). Orthodox eschatology is neither "catastrophic eschatology," a Montanist escape from the world and from the mission of the Church in the world, nor is it an "optimistic eschatology" of secular humanism, which considers the socializing and civilizing process to be the "new creation" (19). Orthodoxy does not preach a "perfect society" on earth or an endless progress of civilization in history, because such an understan­ding ignores the disastrous presence of sin and evil, and, most im­portantly, of death in the world and history. Orthodoxy witnesses by its ecclesial being and life, and especial­ly by its eschatology, to the final liberation of all creation, of humanity and the world from all "principalities and powers and dominions" of the history of this world. This final liberation is confirmed by the historically real resurrection of Christ, and in Christ, first of all by our sacramental rebirth through the "new-creative and life-creative" (καινοποιοῦντος καί ζωοποιοῦντος) Holy Spirit, and then, in the Parousia and the universal Last Judgment, in Christ and by the Holy Spirit through the bodily resurrection of the human race and transforma­tion of all creation, whereupon a new heaven and a new earth will begin. (1) Gregory the Theologian, Theological Discourse 5, Logos 31, 25-26; PG 36.160-61. (3) Maximos the Confessor, Scholia on the Church History, 3, 3, 2, PG 90.137D. (4) Gregory the Theologian, Theological Discourse 2 28, 3; PG 36.29. (5) Maximos the Confessor, Questions to Thalassium, PG 90.284A: " Ἔθος ἐστί τῇ Γραφῇ τούς χρόνους μεταλλάσσειν καί εἰς ἀλλήλους μεταλαμβάνειν· καί τόν μέλλοντα ὡς παρῳχηκότα, καί τόν παρωχηκότα ὡς μέλλοντα· καί τόν ἐνεστώτα εἰς τόν πρό αὐτοῦ καί μετ ' αὐτόν χρόνον ἐκφωνεῖν, ὡς ἔστι δῆλον τοῖς αὐτῆς πεπριρανένοις '. (6) Maximos the Confessor, Questions to Thalassium, PG 90.620-25: « Ὁ προεπινοούμενος Θεῖος σκοπός καί τέλος... τό τῆς προνοίας καί τῶν προεπινοουμένων πέρας ». (7) Maximos the Confessor, Gnostic Chapters 1, 66, PG 90.1108AB.96. (8) Maximos the Confessor, PG 90.137. See also Maximos the Confessor, PG 91.1253. (9) On the Church Hierarchy. (10) See Mansi, Collectio Conciliorum, 13, 261-64. (13) John Zizioulas, Being as Communion (Crestwood, 1985), pp. 67-122. (15) John 6; Luke 22.29-30; Nicholas Cabasilas, Commentary on the Divine Liturgy 38 and 47, PG 150.452-53 and 461-65. (16) John Zizioulas, "The Eucharist: Some Biblical Aspects." In Marne, ed., The Eucharist (Paris, 1970). (17) John Chrysostom, Homilies on Matthew 10.2. PG 57.186. (18) Maximos the Confessor, Mystagogy, 24; PG 91. 704-05. See also the Troparion of the Paschalion hymnology in the Liturgy of Saint John Chrysostom : " 0 Christ, great and most Holy Pascha ! O Wisdom, Word, and Power of God! Vouchsafe that we may more perfectly partake of Thee in the days which know no evening of Thy Kingdom." (19) See John Meyendorff, Orthodoxy in the Contemporary World (New York, 1981) in Russian. From The Greek Orthodox Theological Review 38, 1993, p. 91-102.